Tuning the Pinto Dizzy to match the "fast Cam"
OK, so you've got yourself a good carb, so the next step is to fit a *Fast cam* Which one? 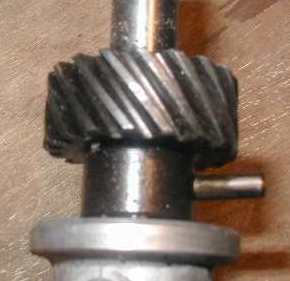 I suggest that you go to Dave Andrews website(cams) and check out his article on camshafts. 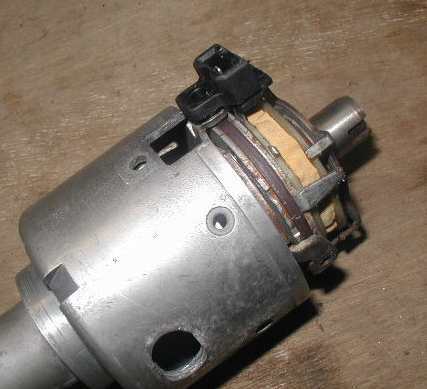 There are a number of cams, giving different driving characteristics, make sure you select the correct one for you. 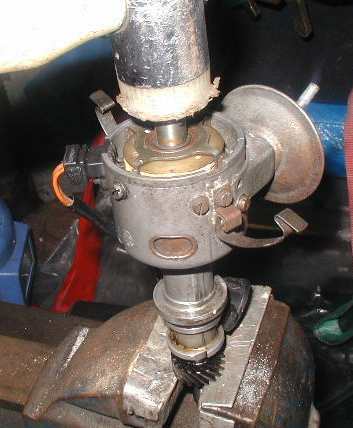 I'm not going to go into camshafts any further, the article on Daves website more than covers that, so we'll except that you've now fitted the cam, set the tappets, run the cam in as required, and you're ready for being pinned to the back of your seat with the new power output! You take it for a test drive and find that it's not much different to the power that you had before, most disappointing! But that's because you've not tuned the ignition side of the engine to match the new camshaft characteristics. go and read up about that on Dave's site here. Now you could go along to one of the many tuning accessory shops and buy a modified dizzy for around �, or you could modify your own with a bit of patience. 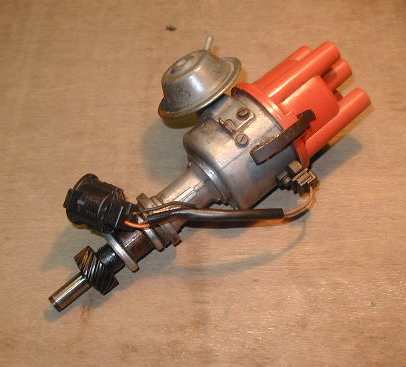 Please Note; This is the way that I and others in the North West have modified their dizzy's, We've tried to get to the springs by first removing the ignition "trigger wheel" from the top, by removing the circlip etc. succeeded only in damaging it and scrapping the dizzy. Before tackling this job, you will need to get hold of a good timing light, one of the type where you can dial in the setting you want, so that you're only using the TDC line on the pulley to check with, this cuts out all that trying to mark up the degrees on the pulley that Dave mentions in his article. 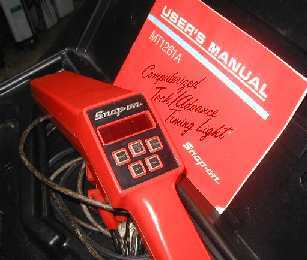 I bought this one off e-bay for �, it can also show RPM as well as advance. this is a cheaper one with a dial on the back, they don't do RPM that are just as good for this job, they bring anything from � upwards on E-bay. I would also strongly recommend that you go along to your local scrappy and get a knackered dizzy (or 2) from him to practice on, also the springs inside will come in useful. 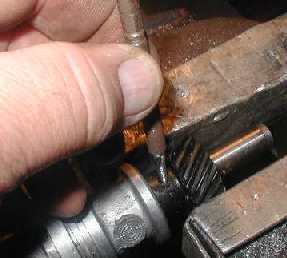 The first job is to remove the drive gear. 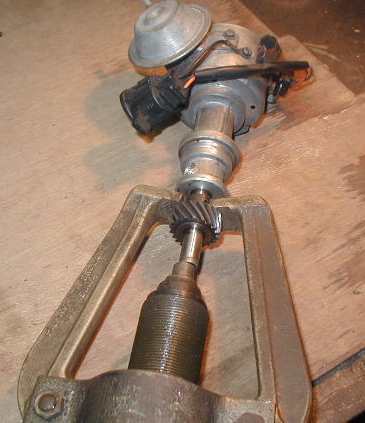 First drive out the "roll pin" that holds the gear in place. 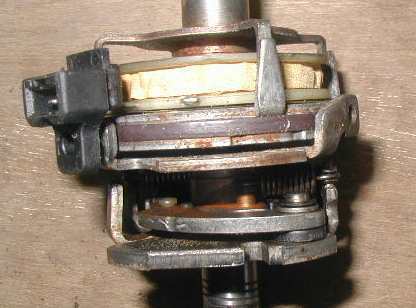 The gear is a Press fit onto the shaft, so will need pulling off. Once the gear is off, then remove all the screws from around the dizzy body, note that the ones in the clamps etc. could be slightly longer than the others. Also prise out the little "window" with a sharp screwdriver. You can now ease the vac advance unit off it's location peg, you don't need to force this. Check that there's no screws left in, then slowly prise the electrical socket from the body as you lift up the innards out of the dizzy body. Once you've lifted the innards out of the dizzy body, it's easy to see the 2 springs that control the mechanical advance of the ignition. 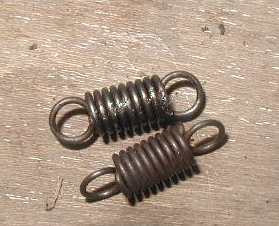 Each dizzy can have different strength springs in than the next one, so stripping a couple of old dizzy's will both give you practice, and spare springs. 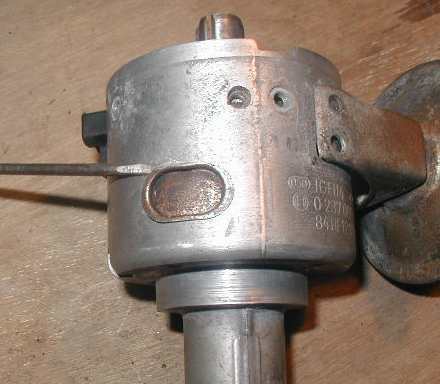 To rebuild the dizzy, once you've fitted the springs that you're going to try, carefully insert the innards back into the body, first lubricating the spindle slightly. 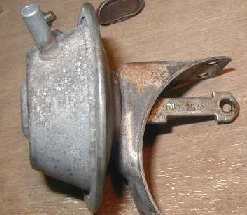 Locate the vac advance onto it's peg and rotate the innards to refit the screws that hold it in place. Refit the rest of the screws & clips etc. along with the little window. That leaves you with just the gear to put on, as I said before, this is a press fit onto the shaft, so firstly place it in some boiling water for a few minutes then using gloves, line up the pin holes and drive the gear back onto the shaft (DO NOT use a blow lamp or similar, as you will affect the hardness properties of the gear) It's very important that you line up the pin holes as you'll not move the gear round once on. Obviously refit the pin. 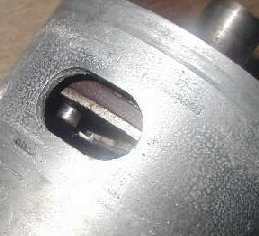 Be very careful that you don't damage the shaft with the mallet, if it's reluctant to go on, pull the gear off again and get it back into the boiling water. Ok, now that you've rebuilt the dizzy, it's time to check on the results. Get the engine running, set the timing roughly at somewhere near 10� BTDC and let it warm up. now with someone else (with a calibrated right foot) the timing light connected, but the vac tube disconnected, rev the engine to 3000 rpm, then 3500rpm, then 4000 rpm, and 4500 rpm. note the ignition advance at each rpm. you are looking for it to reach maximum advance at around 3500 rpm (+/- 150 rpm or so is OK) if it's not getting there until later, then the springs are still too strong, if it's getting there before 3500 rpm, then the springs are too weak (most unusual!) either way, you'll need to remove the dizzy and have another go. If you're happy that it's getting to max advance around 3500 rpm, then you need to set the advance at maximum to the figure shown on Dave Andrews Website(timing) That's 38 -40� BTDC (I run at 35� BTDC) now let the engine go back to idle (around 900 rpm) and note the advance setting there, if it's below 20� BTDC then it's OK, make a note of the idle setting, so that should you ever need to check the ignition, you only need to reset it at the idle setting, knowing that it'll be correct further up the revs. 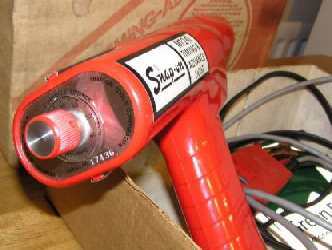 Reconnect the vac advance pipe. ***I can tell you that in the dizzy that I modified, I finished up removing the strongest spring, replacing it with one made from a Biro spring. Another member finished up just using the one week spring only. Please note; This is for information for those that want to use it, I cannot be held responsible for any damage occurred.